Welcome to Shady Pines. This charming, beachy cottage is the perfect home for your family vacation and offers everything you need for a memorable, relaxing stay. This home is only a short walk to the beach, yet is private and quiet. 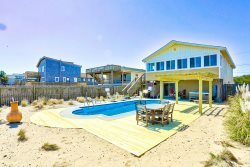 The house backs up to the nature preserve where you can enjoy the gorgeous sound-side sunsets you expect at the Outer Banks as well as occasional wildlife sightings. Recent upgrades and additions include: new quartz kitchen countertops and backsplash and wall mounted TV’s in each bedroom. The bright master bedroom has a beautiful Juniper cathedral ceiling, private bath and deck access. Two additional bedrooms share the hall bath while the Queen bedroom also features deck access. The living area offers a full size sleeper sofa for additional guests. There is plenty of room for everyone, even the four-legged members of the family as this house is pet friendly! The kitchen is well stocked with all the utensils and gadgets you need when you aren't out enjoying a meal at one of the many nearby restaurants. The house is centrally located between Jeanette’s Pier and the Outer Banks Fishing Pier for the angler in the family. A propane grill awaits to cook the day’s catch! Located in South Nags Head, you will be only minutes away from the Tanger Outlets, local water sports, miniature golf, Oregon Inlet and Pirate’s Cove. A convenient multi-use path for jogging, biking or walking is also very close by. The home is tastefully decorated and awaits your family to experience all the Outer Banks has to offer! Super friendly staff. The house, Shady Pines, is so pretty and nice, super clean, fully stocked. The grocery delivery is the best! So glad we used Seaside!